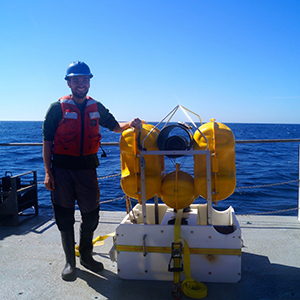 Stephen Hicks, a PhD student in the School of Environmental Sciences, is part of a scientific team currently on a three-week research cruise in the Pacific Ocean to understand earthquake hazard along the western coast of the United States. “The northwest coast of America lies along the Pacific Ring of Fire – the plate tectonic boundary that is responsible for the world’s largest and most damaging earthquakes. In the past decade, the earthquake hazard around the Pacific Rim has made dramatically clear, particularly from the 2004 Indonesia and 2011 Japan earthquakes and their resulting tsunamis. Along the northwest coast of America, the same giant forces as those in Japan and Indoneisa are at work. Here, the Pacific seafloor is sinking beneath the North American continent, drawing huge battlelines between two tectonic plates. We call sinking of tectonics plates subduction. The last strong earthquake to hit this region was magnitude nine. Evidence suggests that this type of earthquake has taken place seven times in the past 3,500 years. This history indicates that earthquakes along the Cascadia margin tend to occur every 400 to ­600 years. The Cascadia subduction zone has been eerily quiet for a while – this could suggest that stress is building along the fault and the two plates may be almost fully locked against each other. Based on historical data, there is nearly a 40% chance of a major earthquake occurring in this region within the next 50 years. With large population centres along the coast and major cities such Seattle and Portland in the region, authorities aren’t taking any chances. The US Government has funded a $10m experiment to understand the earthquake hazard in the Pacific Northwest. The Cascadia Initiative aims to deploy GPS and seismic stations to monitor strain along the fault. By measuring slight changes in the movement the crust and monitoring small earthquakes, we may able to understand better the nature of future great earthquakes. At Liverpool, we have done a lot of research on recent subduction zone earthquakes in Indonesia and South America. With our knowledge of the nature of earthquakes in these regions, we are in a good position to understand future earthquake hazard in other regions, such as the northwest United States. I was lucky enough to take part in this cruise, and it is a good opportunity to involve European researchers into the project. 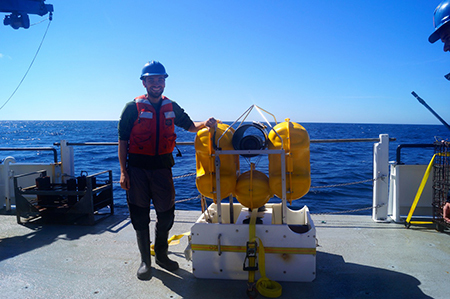 Life aboard Research Vessel Oceanus has been enlightening and I have been startled by the immense hard work that goes into these offshore geophysical experiments. Ship time is very costly, so the crew, technical team and science party all work around the clock to ensure that the experiment finishes on time. The weather has been rough and coping with seasickness has been tough.